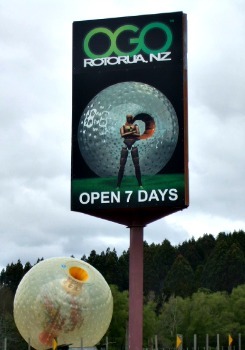 Zorbing in Rotorua is so much FUN. Seriously! And who would choose to miss out on that? Youngsters? Doubt it. They'll be beside themselves with excitement. Those of us on the older side? Might take a bit of persuading but hey, why not, we like to play too, don't we? Come on, back me up here. What about those in the in-between years? Ah now, that's when you play hard-out anyway so no need to say anything further on that. Let's play! If you don't know what zorbing is, it's simply you inside a giant semi-transparent plastic ball, inside another plastic ball, rolling on grass tracks down a hill. Think of the lotto barrels. 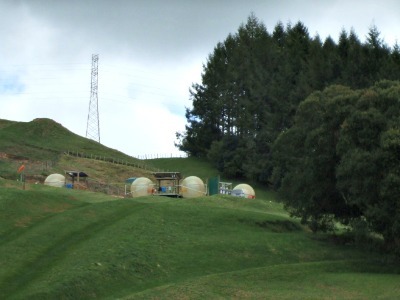 In Rotorua, two companies provide this activity, OGO Rotorua and Zorb Rotorua. Both are located on the western side of the city. Is Zorbing Fun People Ask? Hello, of course it's fun. I tried zorbing when a friend gave me a couple of tickets. She had bought them on Grab One, a 1 day sale site, and couldn’t use them herself. Due to expire at the end of the day in question - I know, no notice whatsoever - it was now or never. I took a towel and suitable clothing out to Zorb Rotorua… yes, I was going to be brave and have the wet experience. For that I would need dry clothing to get changed back into. There were a few hardy souls about including a couple of young English boys who'd already been down a few times. Despite goose pimpled skin and bouts of shivering they still went back for more (there's a spa pool to warm up between rides now). Jumping into the onsite vehicle we headed uphill to the zorb station. Nervously I watched as the others took their turns. When it came time for mine it was such a relief to find out the water inside the zorb was warm. End result of zorbing in Rotorua ... not pretty. I don’t think there's a dignified way of getting into a zorb. Diving in head first, I came to a screeching halt halfway - stuck on the plastic - then had to wiggle the rest of the way before falling face-first into the water. Hallelujah, it was like being in a steamy spa. Once it got going I couldn't help but laugh, the whole way. I felt like a bug trapped in a giant washing machine. The only thing missing were the soapsuds. Swish up one side then the other, water up my nose, in my hair, I was soaked. It was such fun though. If it had been a warmer day I would have gone back up again and again because it could get seriously addictive. Funny thing though, the shortest ride is about 40 seconds but feels quite a lot longer when you’re in the ball. That's enough about me, let's get onto our two zorbing companies. Andrew Ackers is the co-inventor of the zorbing ball and one of the original owners of Zorb Rotorua. 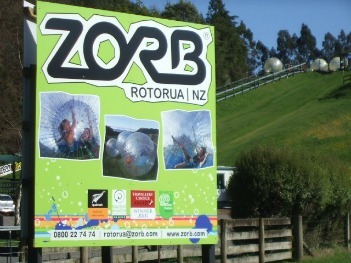 Yes, our other Rotorua zorbing company. For various reasons they parted company in 2006. A number of years later, he and brother David decided to have another go and set up OGO on the site where Zorb Rotorua originally began. 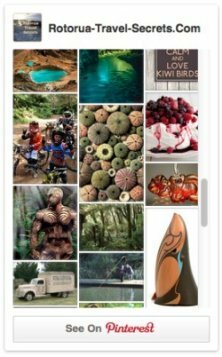 OGO Rotorua is located on the side of Mt Ngongotaha overlooking Lake Rotorua and Mokoia Island, an ideal spot to take fantastic photos, and to enjoy any one of the 3 spa pools. Try one of the two up the top of the hill. Four tracks range in length from 250m - 350m (longest in the world). 250m Straight Track - A long straight slope with dual tracks. You can race others. :) A choice of wet (H2OGO) or dry (DRYGO) rides and 1-3 people per ride. 350m Sidewinder Track -Wet or dry rides will see you rolling downhill weaving in a snakelike pattern with 6 high corner banks to spice things up. You won't know which way is up. 1-3 riders. 300m Big Air Track -It's all wet on this ride that includes 3 drops, bends and straight sections. Limited to one person only. 300m Mega Track -It's high, straight and long. 2 riders max. Prices begin at $45 - $75pp for one rider, becoming up to $10 cheaper with multiple riders. Multi ride combos are also available from $85 - $160pp. Dry rides are unavailable in the summer due to heat. Minimum age is 5yrs on all rides. Maximum weights: 125kg/275lb for one rider or 250kg/551lb multiple riders. Don't worry if you haven't got the right gear. OGO rents shorts, a t-shirt and towel for $7 at the moment. Bonus: A photographer takes photos and a video of your ride but you can also make use of a GOPRO camera to use inside the ball while you're riding. You can then buy photos or the video ($30 singly or $50 for both). You can take your own waterproof GOPRO or camera if that's preferable. 9am-6pm summer hours, 9am-5pm winter hours, 7 days a week, closed Christmas Day. All hail to the original zorbing in Rotorua experience which is the one I visited and, as outlined above, it was a fantastic experience. The staff were lovely, very solicitous. Somehow I don’t think they believed I was going to do it. Just because we’re getting older doesn’t mean we don't want to live a little, does it? 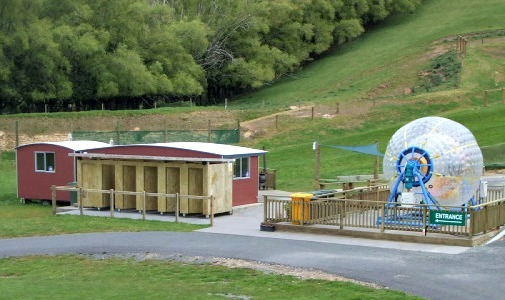 With Zorb Rotorua, in addition to the straight and winding track variations a third is simply called The Drop (sounds scary). You have a choice of wet or dry for all the rides. Dry rides are unavailable in the summer due to heat. The Fast Lane - Dual tracks with a long straight slope where you can race against others or have 1-3 people ride their wave together. The Drop Track -It's the drop to end all drops and a fast ride as well. Limited to one person only. Prices begin at $45 - $85pp for one rider, becoming up to $10 cheaper with multiple riders. Multi rider combos are available at $80 for 2 riders and $105 for 3 riders. It took a bit to work out the $120 Family Pass for 2 adults, and 2 kids (still at school). One pass is for 1 ride per person. It can also be taken as 2 doubles or 1 triple ride and a single. Minimum age is 6yrs on all rides. Maximum weights: 130kg/286lb for one rider or 250kg/551lb up to 3 riders. Zorb Rotorua rents clothing and towels at $5 per set or $2 per item. Camera hire is available for $25. Take your own mini-sd or sdcard, or a flash drive and staff will transfer the files directly it, or to a flash drive that can be purchased. Another option is to have the files sent to you for $5. You can take your own waterproof camera or GOPRO too. Once at the bottom heat up in the outdoor hotpool (you won't need this in the summer), grab a drink or bite to eat from the vending machine, and make use of the free wi-fi in between watching your friends. A bbq is available for use or staff at Zorb can do a package deal for you. If you're stuck for a ride, Zorb will pick you up. Handy! 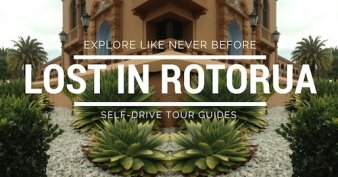 Check out the google map to get your bearings for driving to OGO Rotorua and Zorb Rotorua. If you're on foot, no problem, the CityRide Bus - Route 1 runs every ½ hour Mon-Sat and hourly on a Sunday. It stops by Skyline Skyrides and Rainbow Springs, with a short walk heading away from the city to OGO Rotorua. It also stops by the Agrodome which is across the road from Zorb Rotorua with Velocity Valley just around the corner (access can be via the Agrodome grounds underneath the highway too). If you're thinking of doing any of these other activities it may pay to do them all on the same day. 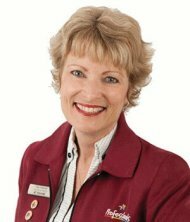 Start early and take lots of fuel as you will burn quite a bit of energy. Both places have vending type food and drink. Something you can get wet in and a towel. Apart from minimum age and weight restrictions, medical conditions include high blood pressure, epilepsy, pregnancy, heart problems, back, neck or head injuries, lack of full body mobility, alcohol or drug impairment, or anything else that stops you from riding safely. How long do the rides last? Anywhere from 40secs and up. Is zorbing worth the money? I think so and going by the reviews so do many others. Both zorbing in Rotorua sites have heaps of parking.